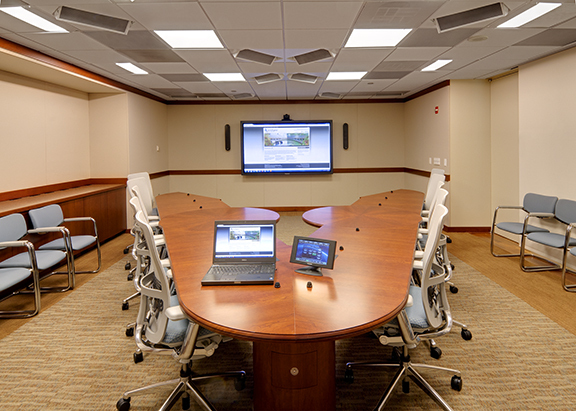 The Department of Homeland Security, Office of Chief Human Capital Officer (CHCO), engaged the Bridges SI team to add a videoconferencing solution for their Executive Conference Room (ECR). The support team was considering a separate effort to purchase commercial off-the-shelf (COTS) furniture to assist with updating the design supporting their senior leadership. After reviewing their business-process model, it became clear that Bridges SI could deliver a complete environment, thus supporting their specific requirements enabling enhanced collaboration, brainstorming and management. The Bridges SI interior design department walked the client through the design process. That process includes needs and requirements identification, as well as schematic and full rendered designs, therefore helping the client select their most appealing solution. 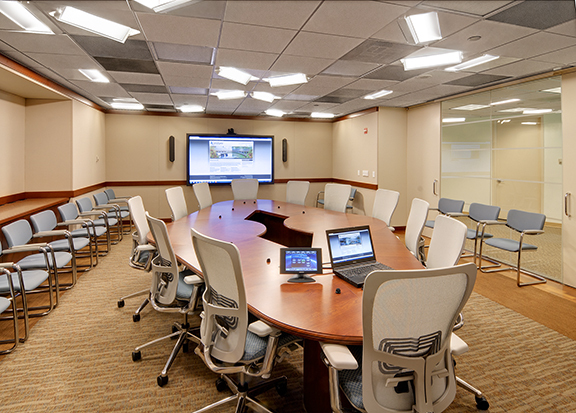 The challenge was to balance conflicting objectives supporting a local collaboration setting while striving to deliver on the video teleconference positioning. A variety of table designs were presented with initial renderings. After reviewing their options, CHCO selected a unique diamond table design that allowed for a close, face-to-face engagement and also has two pivoting spans that open. 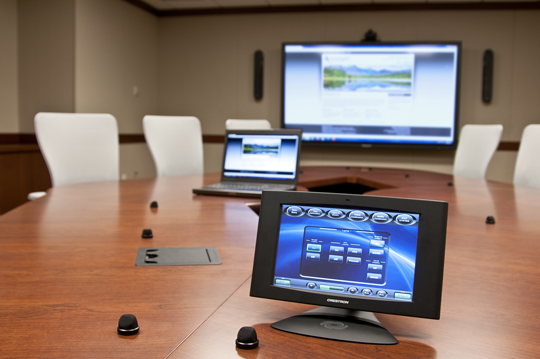 These spans provide the videoconferencing camera with a perspective to each participant’s facial cues. Other details leveraged to support the technology environment including case goods, sound paneling, application-specific lighting and motorized shades. The focal point of the technological solution, from a systems perspective, was an 85” high-definition flat-panel display. Proper engineering of this system contributed to the selection of the display. Contributing to the selection decision were considerations such as: a through overall distance measurement from the display to the furthest viewer, and the lengthy duration of meetings, mandating a high-contrast and easy-to-read display from any angle. 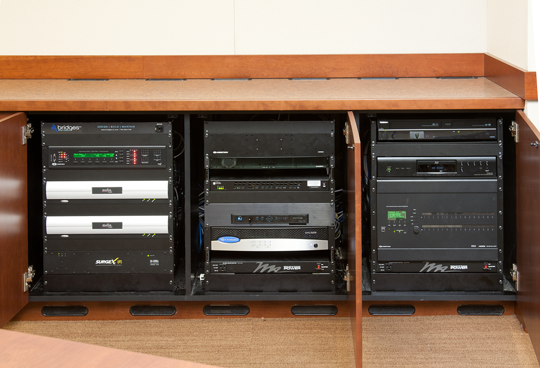 Multiple table boxes enabling multiple computers to connect to the system allowed for collaboration and superior cable management. The core of the system was based on a digital switching system that supported analog and digital signals. The entire system supported High-Bandwidth Digital Content Protection (HDCP) sources, allowing CHCO the flexibility to display from a wide variety of sources and future hardware technology. 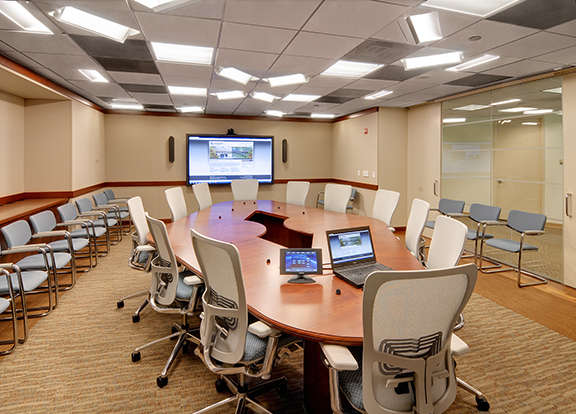 Throughout the year, CHCO requires meeting space beyond what any single room will comfortably permit. Bridges SI identified this significant requirement early on in client interviews. From that analysis, an enterprise distribution system was designed and deployed. The videoconferencing camera was leveraged to provide a video feed into the divisible training facility below. Additionally, a recording and streaming solution enables asynchronous communication for reaching new employees, as well as enhancing flexibility for telework employees keeping them informed and offering them the opportunity to maintain a high-level of participation. CHCO’s conference facilities host critical meetings supporting the Department of Homeland Security mission. As such, the Sustain practice has provided facilitators to augment the departments support teams. In addition, Bridges SI has deployed an enterprise case-management system for CHCO to generate and manage cases with the objective of maximizing uptime and optimal utilization of system capabilities.